You are everywhere in South Korea. Have you ever think when you walk around on the street, you see yellow paving like the picture above? Do you know what is that? Have you ever wondered what are those yellow dotted pavements and yellow lined pavements for? in Seohyun station (?) (I forgot. We were busy catching up subway in Seoul, so I only took the photo while walking. By the way, they said because the name of that station is the same with one SNSD member, they filled the station with SNSD’s Seohyun memorabilia, but I didn’t see any) wondered why the design was different from the usual ones then tell my friends about it, they didn’t feel the same wondered feeling with mine. “Quick, what are those yellow paving for?” you ask? 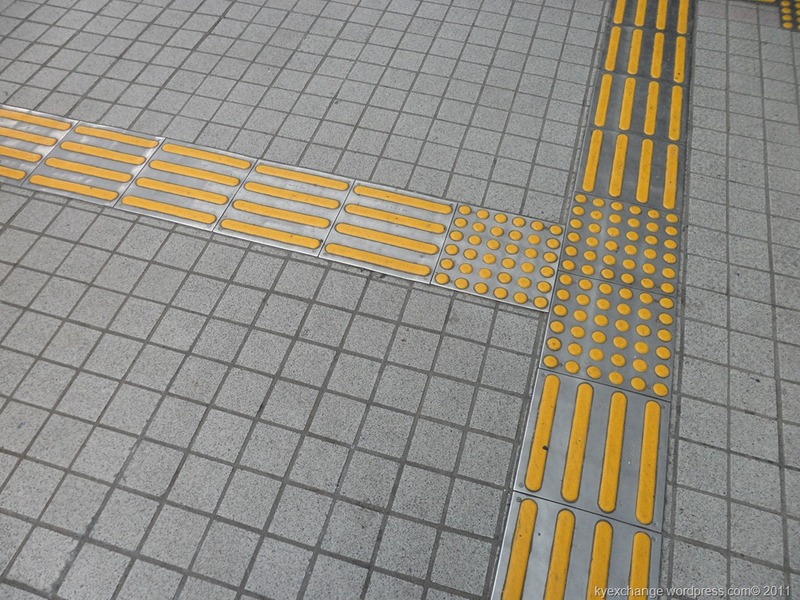 Those yellow paving are Tactile Pavings, or if we go with specific term, Tactile Ground Surface Indicator (TGSIS). They are used in sustainable city design, usually build on pedestrian, stairs, and train stations to assist blind and vision impaired pedestrians. They can be detected by using cane or underfoot, so they can help those pedestrians in locating ways. As far I know, the lines mean straight road and the dotted ones mean either junction or attention/ careful. First applied in Japan., now they are so common in big cities, and some countries have regulation on them, like United States with Americans with Disabilities Act and City of London Facility Accessibility Design Standards (FADS). In my campus back home in Yogyakarta, tactile pavings are applied since early 2000-ish. Why they are yellow? It is because to achieve best result (for vision impairment), it is better to have them in high luminance contrast with the ground. So, which other colour other than yellow (other colours do exist)? Some are built discrete (dots on ground) or integrated (by paving). 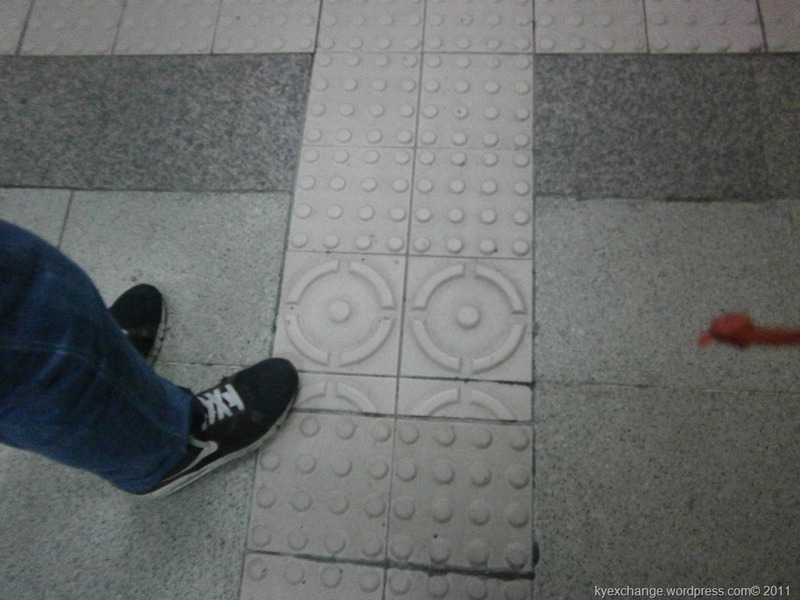 Verdict, what was weird with the paving in Seohyun station? You see the dot in the middle of the circle motif? That was it. I don’t know the meaning of that paving.